Light propagation models often simplify the interface between the optical fiber probe tip and tissue to a laterally uniform boundary with mismatched refractive indices. Such simplification neglects the precise optical properties of the commonly used probe tip materials, e.g. stainless steel or black epoxy. In this paper, we investigate the limitations of the laterally uniform probe-tissue interface in Monte Carlo simulations of diffuse reflectance. In comparison to a realistic probe-tissue interface that accounts for the layout and properties of the probe tip materials, the simplified laterally uniform interface is shown to introduce significant errors into the simulated diffuse reflectance. J. R. Mourant, I. J. Bigio, J. Boyer, R. L. Conn, T. Johnson, and T. Shimada, “Spectroscopic diagnosis of bladder cancer with elastic light scattering,” Lasers Surg. Med. 17(4), 350–357 (1995). F. Bevilacqua, D. Piguet, P. Marquet, J. D. Gross, B. J. Tromberg, and C. Depeursinge, “In vivo Local Determination of Tissue Optical Properties: Applications to Human Brain,” Appl. Opt. 38(22), 4939–4950 (1999). A. N. Yaroslavsky, P. C. Schulze, I. V. Yaroslavsky, R. Schober, F. Ulrich, and H. J. Schwarzmaier, “Optical properties of selected native and coagulated human brain tissues in vitro in the visible and near infrared spectral range,” Phys. Med. Biol. 47(12), 2059–2073 (2002). I. J. Bigio, S. G. Bown, G. Briggs, C. Kelley, S. Lakhani, D. Pickard, P. M. Ripley, I. G. Rose, and C. Saunders, “Diagnosis of breast cancer using elastic-scattering spectroscopy: preliminary clinical results,” J. Biomed. Opt. 5(2), 221–228 (2000). G. M. Palmer, C. Zhu, T. M. Breslin, F. Xu, K. W. Gilchrist, and N. Ramanujam, “Monte Carlo-based inverse model for calculating tissue optical properties. Part II: Application to breast cancer diagnosis,” Appl. Opt. 45(5), 1072–1078 (2006). D. Arifler, C. MacAulay, M. Follen, and R. Richards-Kortum, “Spatially resolved reflectance spectroscopy for diagnosis of cervical precancer: Monte Carlo modeling and comparison to clinical measurements,” J. Biomed. Opt. 11(6), 064027 (2006). G. Zonios, L. T. Perelman, V. Backman, R. Manoharan, M. Fitzmaurice, J. Van Dam, and M. S. Feld, “Diffuse Reflectance Spectroscopy of Human Adenomatous Colon Polyps In Vivo,” Appl. Opt. 38(31), 6628–6637 (1999). Z. Ge, K. T. Schomacker, and N. S. Nishioka, “Identification of Colonic Dysplasia and Neoplasia by Diffuse Reflectance Spectroscopy and Pattern Recognition Techniques,” Appl. Spectrosc. 52(6), 833–839 (1998). M. B. Wallace, L. T. Perelman, V. Backman, J. M. Crawford, M. Fitzmaurice, M. Seiler, K. Badizadegan, S. J. Shields, I. Itzkan, R. R. Dasari, J. Van Dam, and M. S. Feld, “Endoscopic detection of dysplasia in patients with Barrett’s esophagus using light-scattering spectroscopy,” Gastroenterology 119(3), 677–682 (2000). I. Georgakoudi, B. C. Jacobson, J. Van Dam, V. Backman, M. B. Wallace, M. G. Müller, Q. Zhang, K. Badizadegan, D. Sun, G. A. Thomas, L. T. Perelman, and M. S. Feld, “Fluorescence, reflectance, and light-scattering spectroscopy for evaluating dysplasia in patients with Barrett’s esophagus,” Gastroenterology 120(7), 1620–1629 (2001). U. Utzinger, M. Brewer, E. Silva, D. Gershenson, R. C. Blast, M. Follen, and R. Richards-Kortum, “Reflectance spectroscopy for in vivo characterization of ovarian tissue,” Lasers Surg. Med. 28(1), 56–66 (2001). R. H. Wilson, M. Chandra, J. Scheiman, D. Simeone, B. McKenna, J. Purdy, and M.-A. Mycek, “Optical spectroscopy detects histological hallmarks of pancreatic cancer,” Opt. Express 17(20), 17502–17516 (2009). S. Y. Lee, W. R. Lloyd, M. Chandra, R. H. Wilson, B. McKenna, D. Simeone, J. Scheiman, and M.-A. Mycek, “Characterizing human pancreatic cancer precursor using quantitative tissue optical spectroscopy,” Biomed. Opt. Express 4(12), 2828–2834 (2013). E. Salomatina, B. Jiang, J. Novak, and A. N. Yaroslavsky, “Optical properties of normal and cancerous human skin in the visible and near-infrared spectral range,” J. Biomed. Opt. 11(6), 064026 (2006). G. Zonios, A. Dimou, I. Bassukas, D. Galaris, A. Tsolakidis, and E. Kaxiras, “Melanin absorption spectroscopy: new method for noninvasive skin investigation and melanoma detection,” J. Biomed. Opt. 13(1), 014017 (2008). A. Kienle, L. Lilge, M. S. Patterson, R. Hibst, R. Steiner, and B. C. Wilson, “Spatially resolved absolute diffuse reflectance measurements for noninvasive determination of the optical scattering and absorption coefficients of biological tissue,” Appl. Opt. 35(13), 2304–2314 (1996). R. M. P. Doornbos, R. Lang, M. C. Aalders, F. W. Cross, and H. J. Sterenborg, “The determination of in vivo human tissue optical properties and absolute chromophore concentrations using spatially resolved steady-state diffuse reflectance spectroscopy,” Phys. Med. Biol. 44(4), 967–981 (1999). G. Zonios, J. Bykowski, and N. Kollias, “Skin melanin, hemoglobin, and light scattering properties can be quantitatively assessed in vivo using diffuse reflectance spectroscopy,” J. Invest. Dermatol. 117(6), 1452–1457 (2001). P. R. Bargo, S. A. Prahl, T. T. Goodell, R. A. Sleven, G. Koval, G. Blair, and S. L. Jacques, “In vivo determination of optical properties of normal and tumor tissue with white light reflectance and an empirical light transport model during endoscopy,” J. Biomed. Opt. 10(3), 034018 (2005). A. Kim, M. Roy, F. Dadani, and B. C. Wilson, “A fiberoptic reflectance probe with multiple source-collector separations to increase the dynamic range of derived tissue optical absorption and scattering coefficients,” Opt. Express 18(6), 5580–5594 (2010). W.-C. Lin, S. A. Toms, M. Johnson, E. D. Jansen, and A. Mahadevan-Jansen, “In Vivo Brain Tumor Demarcation Using Optical Spectroscopy,” Photochem. Photobiol. 73(4), 396–402 (2001). B. Yu, A. Shah, V. K. Nagarajan, and D. G. Ferris, “Diffuse reflectance spectroscopy of epithelial tissue with a smart fiber-optic probe,” Biomed. Opt. Express 5(3), 675–689 (2014). T. Papaioannou, N. W. Preyer, Q. Fang, A. Brightwell, M. Carnohan, G. Cottone, R. Ross, L. R. Jones, and L. Marcu, “Effects of fiber-optic probe design and probe-to-target distance on diffuse reflectance measurements of turbid media: an experimental and computational study at 337 nm,” Appl. Opt. 43(14), 2846–2860 (2004). U. A. Gamm, S. C. Kanick, H. J. Sterenborg, D. J. Robinson, and A. Amelink, “Measurement of tissue scattering properties using multi-diameter single fiber reflectance spectroscopy: in silico sensitivity analysis,” Biomed. Opt. Express 2(11), 3150–3166 (2011). V. Sharma, S. Shivalingaiah, Y. Peng, D. Euhus, Z. Gryczynski, and H. Liu, “Auto-fluorescence lifetime and light reflectance spectroscopy for breast cancer diagnosis: potential tools for intraoperative margin detection,” Biomed. Opt. Express 3(8), 1825–1840 (2012). 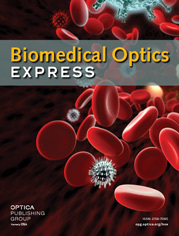 U. Utzinger and R. R. Richards-Kortum, “Fiber optic probes for biomedical optical spectroscopy,” J. Biomed. Opt. 8(1), 121–147 (2003). C. Zhu, Q. Liu, and N. Ramanujam, “Effect of fiber optic probe geometry on depth-resolved fluorescence measurements from epithelial tissues: a Monte Carlo simulation,” J. Biomed. Opt. 8(2), 237–247 (2003). G. M. Palmer and N. Ramanujam, “Monte Carlo-based inverse model for calculating tissue optical properties. Part I: Theory and validation on synthetic phantoms,” Appl. Opt. 45(5), 1062–1071 (2006). R. Hennessy, S. L. Lim, M. K. Markey, and J. W. Tunnell, “Monte Carlo lookup table-based inverse model for extracting optical properties from tissue-simulating phantoms using diffuse reflectance spectroscopy,” J. Biomed. Opt. 18(3), 037003 (2013). I. Fredriksson, M. Larsson, and T. Strömberg, “Inverse Monte Carlo method in a multilayered tissue model for diffuse reflectance spectroscopy,” J. Biomed. Opt. 17(4), 047004 (2012). D. J. Cappon, T. J. Farrell, Q. Fang, and J. E. Hayward, “Fiber-optic probe design and optical property recovery algorithm for optical biopsy of brain tissue,” J. Biomed. Opt. 18(10), 107004 (2013). L. Wang, S. L. Jacques, and L. Zheng, “MCML-Monte Carlo modeling of light transport in multi-layered tissues,” Comput. Methods Programs Biomed. 47(2), 131–146 (1995). E. Alerstam, T. Svensson, and S. Andersson-Engels, “Parallel computing with graphics processing units for high-speed Monte Carlo simulation of photon migration,” J. Biomed. Opt. 13(6), 060504 (2008). A. N. Bashkatov, E. A. Genina, and V. V. Tuchin, “Optical properties of skin, subcutaneous, and muscle tissues: a review,” J. Innov. Opt. Health Sci. 4(1), 9–38 (2011). S. L. Jacques, “Optical properties of biological tissues: a review,” Phys. Med. Biol. 58(11), R37–R61 (2013). W. G. Zijlstra, A. Buursma, and O. W. van Assendelft, Visible and Near Infrared Absorption Spectra of Human and Animal Haemoglobin: Determination and Application (VSP, 2000). C. F. Bohren and D. R. Huffman, Absorption and Scattering of Light by Small Particles (John Wiley & Sons, 2008). I. D. Nikolov and C. D. Ivanov, “Optical plastic refractive measurements in the visible and the near-infrared regions,” Appl. Opt. 39(13), 2067–2070 (2000). D. Toublanc, “Henyey-Greenstein and Mie phase functions in Monte Carlo radiative transfer computations,” Appl. Opt. 35(18), 3270–3274 (1996). N. Rajaram, T. H. Nguyen, and J. W. Tunnell, “Lookup table-based inverse model for determining optical properties of turbid media,” J. Biomed. Opt. 13(5), 050501 (2008). S. C. Kanick, V. Krishnaswamy, U. A. Gamm, H. J. Sterenborg, D. J. Robinson, A. Amelink, and B. W. Pogue, “Scattering phase function spectrum makes reflectance spectrum measured from intralipid phantoms and tissue sensitive to the device detection geometry,” Biomed. Opt. Express 3(5), 1086–1100 (2012). X. Zhong, X. Wen, and D. Zhu, “Lookup-table-based inverse model for human skin reflectance spectroscopy: two-layered Monte Carlo simulations and experiments,” Opt. Express 22(2), 1852–1864 (2014). T. J. Farrell, M. S. Patterson, and B. Wilson, “A diffusion theory model of spatially resolved, steady-state diffuse reflectance for the noninvasive determination of tissue optical properties in vivo,” Med. Phys. 19(4), 879–888 (1992). L. Wang, S. L. Jacques, and L. Zheng, “CONV-convolution for responses to a finite diameter photon beam incident on multi-layered tissues,” Comput. Methods Programs Biomed. 54(3), 141–150 (1997). Fig. 1 An example of a realistic stainless steel probe-tissue interface with a photon packet propagation schematic. Photon packet is launched from the point (x, y) in the direction of the unit vector p (blue arrow). The photon packet then propagates through the medium and can afterwards hit the detector fiber (red arrow), stainless steel (yellow arrow) or black epoxy (orange arrow). Fig. 2 Different realistic probe-tissue interfaces used in this study. A linear fiber array stainless steel probe tip (Geometry I-s) and black epoxy probe tip (Geometry I-e). A six-around-one stainless steel probe tip (Geometry II-s) and black epoxy probe tip (Geometry II-e). The color-coded probe tip materials are listed in the legend. Fig. 3 The wavelength dependence of the reduced scattering coefficient for different concentrations of the polystyrene microspheres used in the turbid phantoms. Fig. 4 Typical distributions of the simulated diffuse reflectance for different probe-tissue interfaces (PTI) obtained at 220 µm source-detector separation. Fig. 5 Relative errors between the Monte Carlo simulations of diffuse reflectance obtained for the laterally uniform and the realistic stainless steel probe-tissue interfaces (Geometry I-s) as a function of the single-layer semi-infinite medium absorption and reduced scattering coefficients. The relative errors are given for the source-detector separations of (a) 220 µm, (b) 440 µm, (c) 660 µm, (d) 880 µm and (e) 1100 µm. Fig. 6 Relative errors between the Monte Carlo simulations of diffuse reflectance obtained for the laterally uniform and the realistic stainless steel probe-tissue interfaces (Geometry I-s) as a function of the stainless steel probe tip reflectivity and single-layer semi-infinite medium reduced scattering coefficient. Absorption coefficient was set to 0 cm−1. The relative errors are given for the source-detector separations of (a) 220 µm, (b) 440 µm, (c) 660 µm, (d) 880 µm and (e) 1100 µm. Fig. 7 Relative errors between the Monte Carlo simulations of diffuse reflectance obtained for the laterally uniform and the realistic black epoxy probe-tissue interfaces (Geometry I-e) as a function of the single-layer semi-infinite medium absorption and reduced scattering coefficients. The relative errors are given for the source-detector separations of (a) 220 µm, (b) 440 µm, (c) 660 µm, (d) 880 µm and (e) 1100 µm. Fig. 8 Relative errors between the Monte Carlo simulations of diffuse reflectance obtained for the laterally uniform and the realistic stainless steel probe-tissue interfaces (Geometry II-s) as a function of (a) the single-layer semi-infinite medium absorption and reduced scattering coefficients, and as a function of (b) the stainless steel probe tip reflectivity and single-layer semi-infinite medium reduced scattering coefficient. Absorption coefficient in the latter case was set to 0 cm−1. Fig. 9 Relative errors between the Monte Carlo simulations of diffuse reflectance obtained for the laterally uniform probe-tissue interface and the realistic black epoxy probe-tissue interface (Geometry II-e) as a function of the single-layer semi-infinite medium absorption and reduced scattering coefficients. Fig. 10 Monte Carlo (MC) simulations of synthetic biological diffuse reflectance spectra based on the realistic stainless steel probe-tissue interface (PTI) (black line). The corresponding inverse MC model fits based on the laterally uniform PTI (red dashed line) for the (a) 220 µm source-detector separation linear fiber array geometry (Geometry I-s), and the (b) six-around-one fiber geometry (Geometry II-s). Fig. 11 Normalized calibration curves derived from the Monte Carlo (MC) simulated and measured diffuse reflectance spectra of polystyrene microsphere suspensions obtained for the linear fiber array optical probe. MC simulations utilizing (top) the laterally uniform and (bottom) the realistic stainless steel probe tissue interface (PTI) (Geometry I-s). Each column pair represents a different source-detector separation. Fig. 12 Relative errors between the Monte Carlo simulations of diffuse reflectance obtained for the laterally uniform and the realistic stainless steel probe-tissue interfaces (Geometry I-s) as a function of the anisotropy factor for different absorption and scattering coefficients (see legend). The source-detector separation is provided above each figure. Table 1 Extracted parameters obtained by fitting the inverse Monte Carlo model based on the laterally uniform probe-tissue interface to the synthetic biological diffuse reflectance spectra simulated by a Monte Carlo model based on the realistic stainless steel probe-tissue interface. Results are presented for the linear fiber array geometry at a source-detector separation of 220 µm (Geometry I-s). Table 2 Extracted parameters obtained by fitting the inverse Monte Carlo model based on the laterally uniform probe-tissue interface to the synthetic biological diffuse reflectance spectra simulated by a Monte Carlo model based on the realistic stainless steel probe-tissue interface. Results are presented for the six-around-one fiber geometry (Geometry II-s). (1) x= x 0 + ξ 1 r cos( 2π ξ 2 ) , y= y 0 + ξ 1 r sin( 2π ξ 2 ) , z=0 . Extracted parameters obtained by fitting the inverse Monte Carlo model based on the laterally uniform probe-tissue interface to the synthetic biological diffuse reflectance spectra simulated by a Monte Carlo model based on the realistic stainless steel probe-tissue interface. Results are presented for the linear fiber array geometry at a source-detector separation of 220 µm (Geometry I-s). Extracted parameters obtained by fitting the inverse Monte Carlo model based on the laterally uniform probe-tissue interface to the synthetic biological diffuse reflectance spectra simulated by a Monte Carlo model based on the realistic stainless steel probe-tissue interface. Results are presented for the six-around-one fiber geometry (Geometry II-s).